Have you ever eaten something so disgusting you wanted to throw up? Well, now I can honestly say that I have. I used to watch this show called “Man vs. Food” where the host would go across the country and do the most ridiculous eating contests. Although the host never made it to Boston, I’ve taken it into my own hands. Stay tuned for this next episode of Christine vs. Food: Rhett Edition. I’m sure almost all of you have bought something at Rhett’s, located inside the GSU. And while waiting in line you glanced to your left and saw the “Rhett’s Challenge” sign and thought, “Why would anyone do that to themselves?” I know I did. Here’s the breakdown on the Rhett’s Challenge. 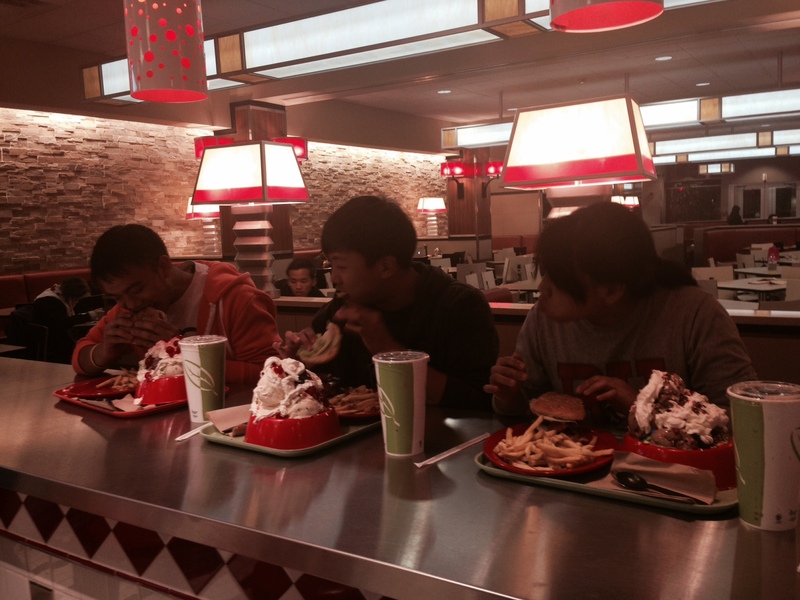 You have to eat 1 triple bacon cheeseburger, 1 large fries, 1 large root beer, and an 8-scoop super sundae. Here’s the kicker — you have 30 minutes to finish. I believe the current record is 12 minutes and 50 seconds. Feel sick yet? It gets better. You are also given a green bucket at the beginning to keep close by because… I think you know why. I’m no jock or heavily built person, but when it comes to eating, I can hold my own. I’m notorious for being the last person to leave Hot Pot Buffet and the first one to finish her half of the wings at BonChon. I’m only 5’0 but I can eat. Confident that I was going to at least finish half of the challenge, I recruited two of my best guy friends to join me. I say that because only good friends travel through that hell with you in solidarity. And there we were. Three friends sitting at the Rhett’s counter with a cup of root beer, a dog bowl full of ice cream and a burger stacked high above a sea of fries. I started out so strongly and attacked the burger with gusto. At one point, the person administering the challenge and my friends who came to watch were cheering my name. That was a nice solid five minutes… then the burger started to settle. I hit the wall so hard and so fast. I was disappointed in myself. 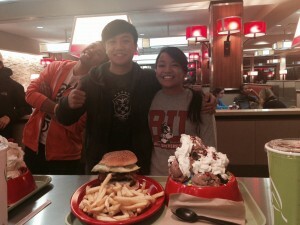 My two friends had also raced far passed me, finishing the burger and fries in a heartbeat. Defeated, I had to continue and give it my best shot. I told myself that at least the fries and burger needed to be gone. The ice cream was like a frozen mountain of death. Eating became a chore and at one point I was struggling to stay up. You know it’s bad when you need to suppress the urge to puke. I have the biggest fear of throwing up in public, so that was not an option. One of my friends did end up making use of the green bucket, but I’d rather not talk about it. As we were struggling to finish, groups of strangers passed by and watched with disgust and awe, and some even took a few pictures. A lot of people were saying, “Oh, I could do that” or “That’s easy.” But I had satisfaction in the fact that I was actually doing it. I don’t care what you think you can do. It’s all talk until you order. People constantly underestimate me because I’m small and because I’m a girl. But at least I’ve tried and that’s more than most people can say. Maybe I’m stupid or maybe I’m brave. All I know is that I walked out of there with a food coma, a weird sense of both satisfaction and dissatisfaction, and a dog bowl trophy. At least it was another unique experience and another fun fact I can use for icebreakers. A BU tradition and a rite of passage, the Rhett’s Challenge will forever be something that makes BU different. The Rhett’s Challenge: defeating BU students since 2007. ← Adrienne in Aussieland: Haunted Australia?